A ‘supermarket’ stocked from marine litter will feature in a new exhibition dedicated to raising awareness of the problem of pollution in our seas. My Sea, Your Sea. Keep it Litter Free will showcase photographs and sculpture from artists who’ve used marine rubbish as the medium for their work. 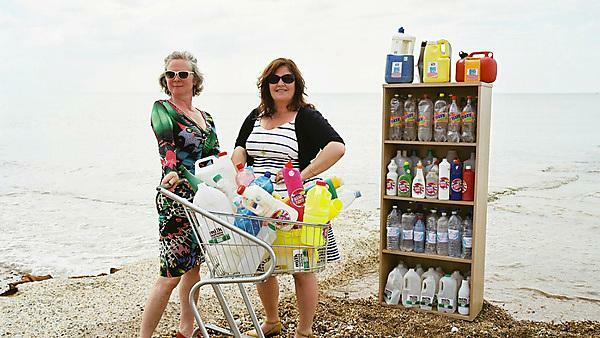 The centrepiece will be 'TruCost Super M-Art', an installation from Brighton artists Lou McCurdy and Chloe Hanks, consisting entirely of consumer products washed up on South West shores, including plastic drinks bottles, lighters, flip-flops, shampoo bottles, cleaning products, cutlery and toys. The exhibition is part of the three-year, €4.5 million EU-funded MARLISCO project, being led in the UK by Professor Richard Thompson and Dr Sabine Pahl of Plymouth University, to engage and educate people on the issue of marine litter. The five-metre-by-three-metre TruCost Super M-Art promises to “subvert the universally mundane shopping experience, raise awareness of plastic pollution in the marine environment and inspire visitors to use plastic in more sustainable ways”. All of its litter ‘products’ have been gathered from beaches in Devon and Cornwall by local cleaning groups. Aside from information about the sources, problems and solutions of marine litter, the exhibition will also feature artwork from photographer Andrew Hughes, a number of sculptures from the Rame Peninsula Beach Care Group (including a guillemot made from cable ties) and a huge whale sculpture from Plymouth graduate Paul Wright, made from recycled plastic bottles. ‘Ocean Warrier’ events, which will be held throughout the summer for children, providing fun but educational activities on how they can tackle the problem of marine litter, including exploring microplastics and plankton with microscopes, uncovering marine litter finds from sandpits, learning about the types of item that marine life often mistakes for food, and recycled artwork workshops. Artist Lou McCurdy and Chloe Hanks will also be at the exhibition on 12 and 13 July to talk about their work. MARLISCO aims to promote co-responsibility among different sectors of society, including recreational and commercial users of the coast and sea, environmental groups, educators, government and policy makers, the media, waste management sectors, and designers, manufacturers and retailers of items that can potentially become marine litter. Exhibition: My Sea, Your Sea. Keep it Litter Free!